First they searched for the Toybox. Then they went beyond the Shadows on the Hill. One of the changelings' own has betrayed them. Now he sails for Ireland, ancient home of the sidhe, accompanied by the Foresworn Prince, who has three of the faerie treasures known as the Immortal Eyes. The remaining oathmates must follow in search of the fourth and final Eyestone, for whoever unites the four gems will discover the secret of the Court of All Kings and open Silver's Gate - the last passageway to Arcadia. Guided by dreams and forgotten lore, they must breach the hidden sanctuary of one of the eldest fae, whose memories of a losst age may determine the future for the children of the Dreaming. 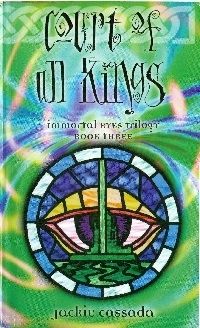 Court of All Kings is the final installment in the Immortal Eyes Trilogy, a companion series to the Immortal Eyes source books from White Wold Game Studio. This title was added to our catalog on July 12, 2010.